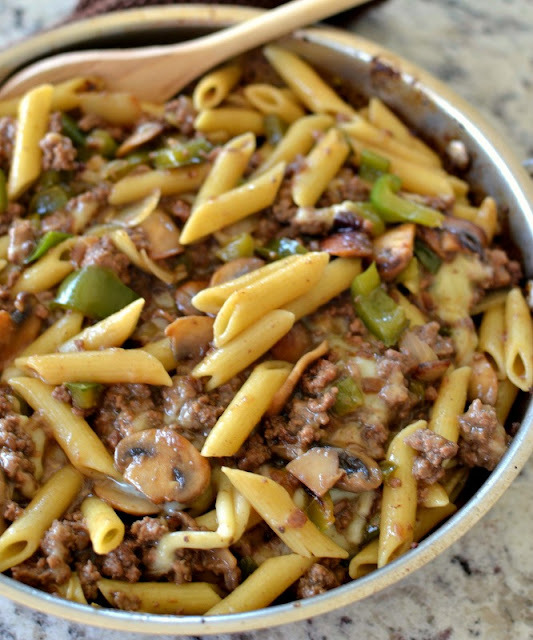 This easy Philly Cheesesteak Pasta combines ground beef, onions, peppers, mushrooms, provolone and penne pasta into a delectable creamy family favorite. Our family always seems to be on the run! Mornings are probably the most hectic time trying to get ready for work and school but the dinner hour comes in as a close second. Meal solutions that come together quickly are great for our busy family. We always have eight things going on at once. There is homework, school activities, laundry, pets to take care for and errands to run. This delectable Philly Cheesesteak Pasta comes together in less than thirty minutes and has only ten ingredients including salt & pepper. You may already have several of these ingredients in your pantry. In a super big hurry? You can brown the ground beef up to a couple of days in advance and store in the fridge. Cook noodles according to package instructions. Drain well. Meanwhile in large skillet over medium heat brown ground beef. Remove to plate leaving any fat in the pan. Melt 2 tablespoons of butter over medium high heat. Swirl the butter several times to keep from burning. Add mushrooms and cook until almost golden brown: approximately 5 minutes. Add onions and peppers and cook additional 2-3 minutes. Reduce heat to low. Stir in french onion soup and Worcestershire sauce. In small bowl whisk together cornstarch and 2 tablespoons cold water. Whisk mixture into skillet and cook for 2 minutes or until slightly thickened. Add browned beef and cooked pasta to skillet with vegetables. Add chopped provolone, cover and melt cheese. Salt & pepper to taste. 0 Response to "Philly Cheesesteak Pasta "